Jingu Gaien, a historic sports venue in Tokyo, will undergo a major transformation in about a decade, in a move driven by the city’s plan to host the 2020 Olympics and Paralympics. In addition to the plan to rebuild the National Stadium before the Olympics, earlier this month the Tokyo Metropolitan Government unveiled a blueprint for post-Games redevelopment of the Gaien district, which has flourished as a “sacred site” for modern sports since the 1920s. It includes plans to rebuild the iconic baseball and rugby stadiums by the end of fiscal 2025. By revamping the now aging sports facilities, the Tokyo Metropolitan Government aims to help the area continue to attract visitors after the Olympics. Below are some questions and answers regarding the redevelopment project. What facilities are targeted in the redevelopment project? The project covers 17 hectares of property, including Jingu Stadium, which was built in 1926 and is owned by Meiji Shrine, and Prince Chichibu Memorial Rugby Ground, which was constructed in 1947 and belongs to the Japan Sport Council (JSC). The nation’s second-oldest baseball stadium after Koshien in Hyogo Prefecture, Jingu is currently home to the Tokyo Yakult Swallows of Nippon Professional Baseball, as well as the capital’s two biggest university baseball leagues. A number of Major League Baseball legends have played in the stadium, including Ty Cobb in 1928 and Babe Ruth in 1934, both on teams representing the league. The Chichibu rugby ground has hosted numerous domestic and international matches, including Japan’s historic 28-24 victory over Scotland in 1989. On April 1, the metropolitan government signed a memorandum on the redevelopment with six relevant parties, including the shrine, which is a major landowner in the district, the JSC and private firms. “The Jingu Gaien district, filled with greenery, still remains a hub of sports. . . . We’d like to advance this major development plan right after the Olympic Games,” Tokyo Gov. Yoichi Masuzoe said at the memorandum-signing ceremony. How will the metro government proceed with the plan? The proposed redevelopment plan involves swapping the locations of the two stadiums, which stand next to each other,in an effort to minimize the impact on sports events. “It’s a fact that Jingu Stadium and the rugby ground are fairly old and replacement will be necessary at some stage in the future,” said Hideaki Ochi, a section chief at the metro government’s urban development bureau. Rather than replacing the facilities separately, Ochi said it’s more reasonable and efficient to proceed under a joint effort that includes related groups aiming to fulfill the same goals. Under the proposal, the Chichibu rugby ground will be demolished first and the space it occupied will be used to build a new baseball stadium, which will be completed by the end of March 2023. 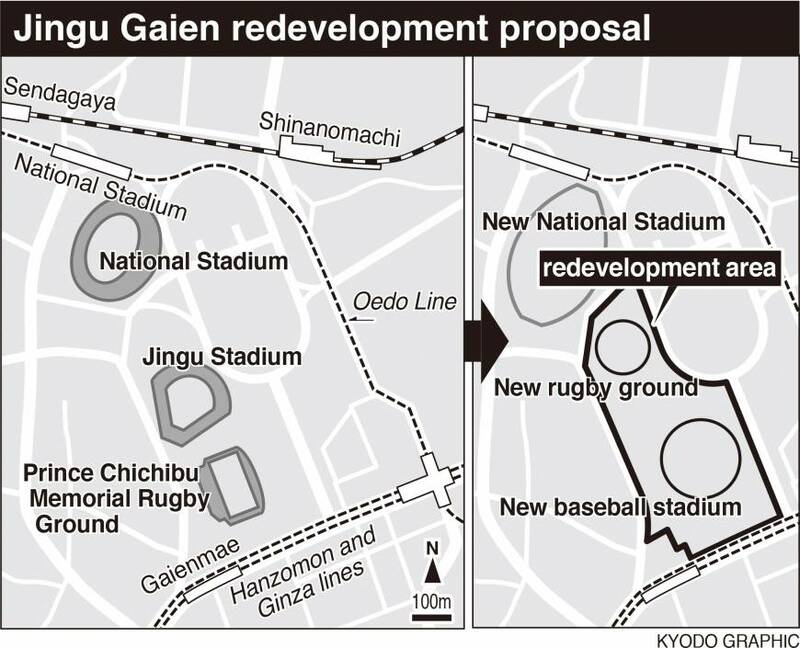 Then the current Jingu Stadium will be torn down to create space for a new rugby ground, which is expected to be constructed by the end of March 2026, according to the redevelopment plan. By doing so, the current Jingu Stadium can continue to serve as a venue for baseball during throughout the redevelopment process, Ochi said. As for rugby, the sport can be played at the new National Stadium in the Gaien district, he said. That facility will be completed by spring 2019, and will host the opening and final matches in the 2019 Rugby World Cup. What other features are under consideration? A new sports center is planned to consolidate various existing sports facilities scattered across the district, including tennis courts and an indoor baseball field, according to the blueprint, while Jingu Sub Stadium, located north of Jingu Stadium, will be demolished. Media reports also said a commercial and office complex will be constructed within the redevelopment area to attract the public, even when there are no major sports events taking place at the stadiums. Yasushi Aoyama, a professor of public policy at Meiji University, said he expects access routes to each facility from nearby subway stations and streets will also be improved. Some experts said the plan should be carried out with consideration for preserving the appearance of the district and the surrounding area. Criticism arose when the gargantuan design of the new National Stadium was first unveiled, as many feared it would mar the surrounding landscape. How have the parties involved reacted to the metro government proposal? If the stadiums are to be replaced, the expenses are expected to be shouldered by the respective owners, namely Meiji Shrine and the JSC. Though officials at those two organizations said they haven’t figured out the costs yet, the metropolitan government has estimated it would cost about ¥20 billion for the new baseball stadium and ¥10 billion to ¥20 billion for the new rugby ground. However, officials from Meijijingu Gaien, an arm of the shrine, and the JSC both said nothing concrete has been decided for the stadiums’ replacements, stressing the signing of the memorandum had only marked the start of discussions on the district’s redevelopment. Ochi of the metropolitan government echoed that view, saying the relevant parties stood at the starting line of cooperation for the redevelopment project.